Cook the kale in a large saucepan of salted boiling water for 1 minute or until just wilted. Remove with a slotted spoon and refresh in cold water. Pat dry on absorbent paper. Place the kale, pine nuts, garlic, pecorino, lemon rind, lemon juice, olive oil, salt and pepper in a small food processor and process until roughly chopped. Set aside. Cook the pasta in a large saucepan of salted boiling water for 10–12 minutes or until al dente. While the pasta is cooking, heat a large, non-stick frying pan over high heat. Add the chorizo and cook for 1–2 minutes each side or until golden. 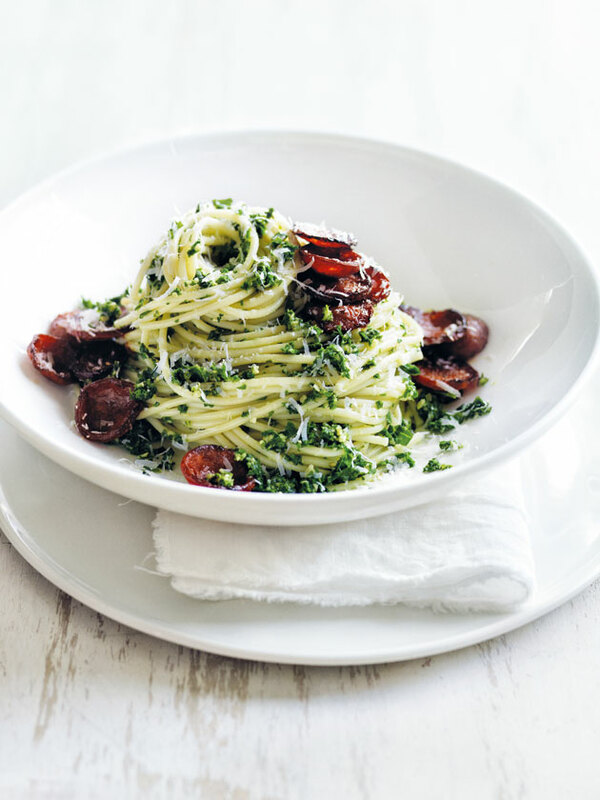 Drain the pasta, return to the saucepan with the pesto and chorizo and toss to combine. Divide between plates and top with extra pecorino to serve. Serves 4.